As a licensing artist, you cannot underestimate the power of a Sell Sheet when promoting your art and patterns to Art Directors and Manufacturers. A Sell Sheet, (also called Tear Sheet) is essentially a marketing tool for your art. Your Sell Sheet doesn’t necessarily close the licensing deal but it’s a big step in creating awareness about you, your company and your art. 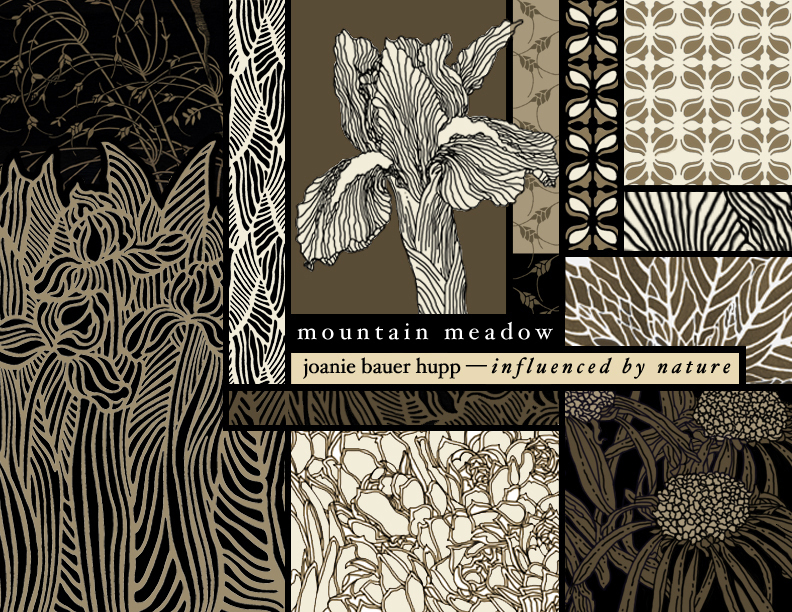 We recently partnered two ArtLicensingShow.com Portfolio Members, Rebecca Baer and Joanie Bauer Hupp, and gave them the challenge to create a Sell Sheet for Joanie’s — Mountain Meadow Collection. Joanie is new to art licensing, starting just under two 2 years ago. Rebecca has been successfully licensing her art for almost a decade now under the brands Rebecca Baer® and Whimsies & Wishes™. We asked Rebecca to guide Joanie in the process to create a Sell Sheet that would show a full collection that included some mock-ups of her patterns. An Art Licensing Collection — is a group of coordinated images that may include illustrations, images, paintings, icons, patterns and borders that center around a particular theme, subject or holiday. Manufacturers prefer to see art in groups (often a set of 4 images) and collections rather than individual pieces. It may also help the manufacturer decide how deep into the product line they may want to go with the collection to sell in stores and online. The more options and variety you provide in your collection, the better! Art Licensing Mock-ups — are when you take your flat artwork and place it onto templates to show what that pattern or design might look like on products. The trick is to keep the scale of the design appropriate for the product and to make it look somewhat realistic for the Art Director or Manufacturer to envision it. 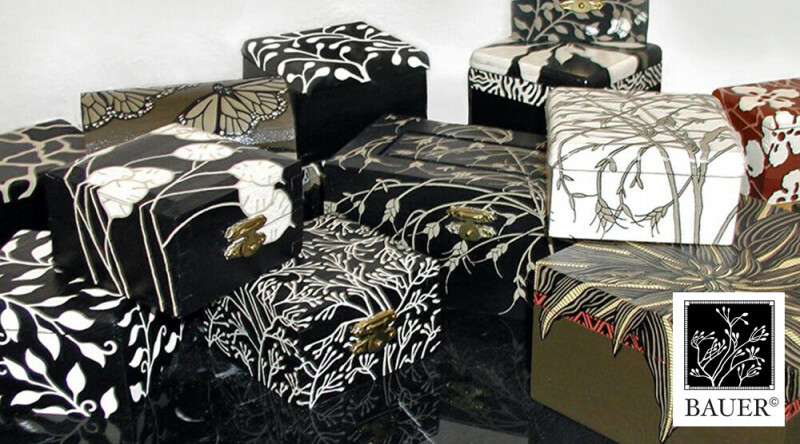 Initially, Joanie’s creative process started with getting the designs from her hand painted boxes into a digital format. So she scanned the boxes and brought those images into Photoshop where she cleaned them up. She also had some other line art drawings in her portfolio that she pulled into the collection. “Joanie and I reviewed a variety of sell sheets and discussed both positive and negative attributes. Among the positives were a focal area or element, complementary support imagery placed to lead the viewer through the sheet and relevant mock ups. The negative qualities included overcrowding, busyness and unrelated mock-ups. Following this we discussed the elements of a collection, i.e., a lead image or images along with supporting imagery including patterns that offered contrast, scale; large/small, density; heavy/light, style; geometric/flowing, etc. 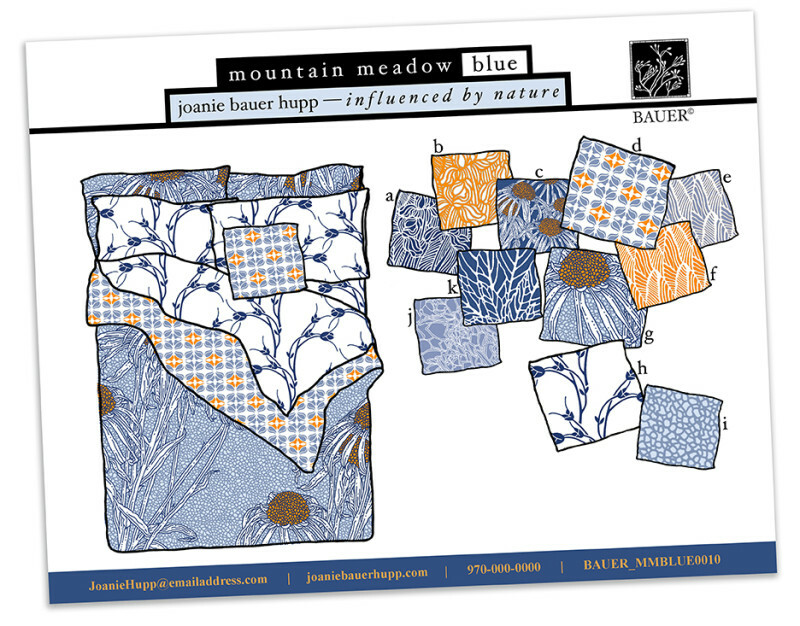 This is how Joanie’s Promotional Graphic came together for her NEW Mountain Meadow Collection! In the final Sell Sheets for her Mountain Meadow Collection, Joanie created two different colorways with the supporting patterns for each. See the new Sell Sheet designs below! Thank you Rebecca and Joanie for this participating in this Sell Sheet project. 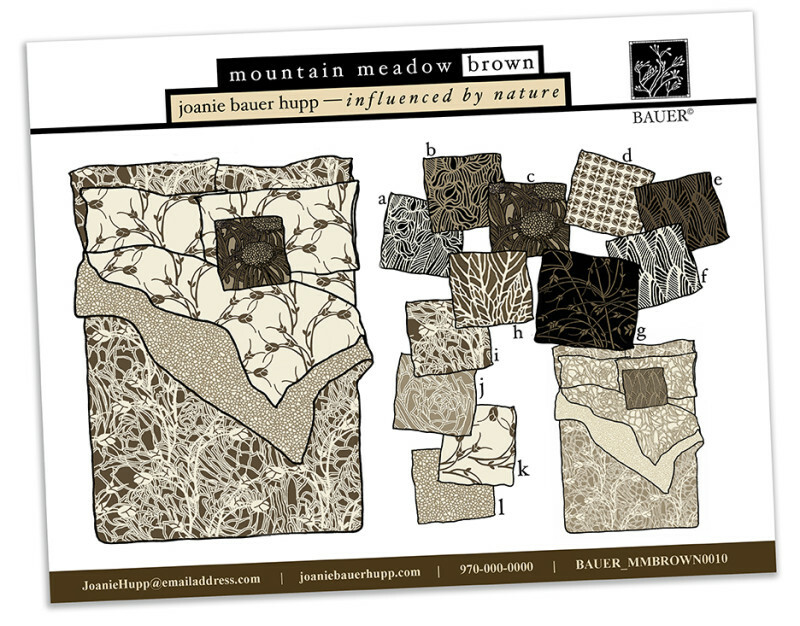 We love everything about how the sell sheet designs came out for Joanie’s NEW Mountain Meadow Collection. Great job! Rebecca is a Designer, Author and Licensed Artist with life long passion for all things creative. 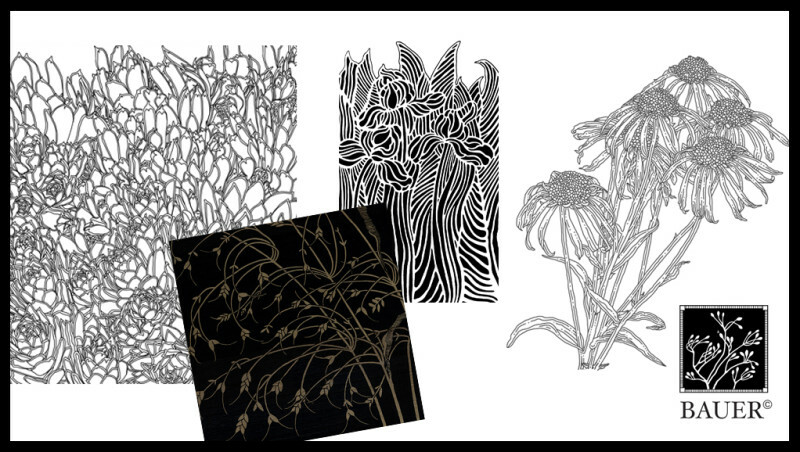 She is the artistic force behind Rebecca Baer®, Inc. Her works are regularly featured in domestic and foreign publications and she has traveled extensively throughout the U.S. and overseas giving workshops to share her unique artistic style with eager painters. Rebecca’s designs combine a sense of sophistication, elegance and harmony; yet have a practical, comfortable quality to them, which makes them stand out from the commonplace. Both Rebecca’s hand-painted style and innovative Whimsies & Wishes™ brand, a sophisticated yet delightfully whimsical series, continually expand with Rebecca’s trademark artistry. Rebecca’s success in licensing has resulted in a range of products bearing her Rebecca Baer® and Whimsies & Wishes™ brand art including home decor, dinnerware, accessories, yard art, giftware, paper party goods, fabric & more. To see more of Rebecca’s work, visit her website at www.rebeccabaer.net or request access to her complete portfolio on the Art Licensing Show.com. Joanie is a Designer, Illustrator and Painter with a substantial career in the graphic design industry for over 20 years. She retired as the Associate Vice President of the Ohio design firm Fitch, Inc. in 1999. She was also blessed to come from a family of artists — with her mother, a watercolor artist and her father a sculptor, encouraging her creative aspirations from childhood. A move to Denver, Colorado in 2001 reconnected her with another previous passion, Figure Skating and teaching. After refocusing on painting and illustration in 2005, Joanie joined the Colorado Watercolor Society and became a signature member in 2007. Her watercolor paintings have been juried in Regional and National Exhibitions. Now working from her home studio in Durango, Colorado, Joanie licenses her beautiful nature-inspired illustrations on several products like scarves, tote bags and pillows. To see more of Joanie’s work, request access to her complete portfolio on the Art Licensing Show.com. This entry was posted in Art Licensing Show + Tell, Tutorials on December 14, 2016 by Art Licensing Show . ← ALSC Holly Jolly Christmas Show! WOW! these look amazing great share thankyou. Thank you for this great information. Now I know what sell sheets are! I was away when all of this was going on, and just returned beginning of January. AWESOME article, ART, (Joanie) and Designs. The sell sheets are inspiring and I’d be amazed if you don’t get some wonderful opportunities from these. As you know, I love “design” and am a big admirer of your work Joanie. I’m so glad you had this opportunity. It was a good lesson for us all. Thank you, Rebecca and Joanie! Hey Jo!!! Thanks for your nice comment!!! I am so grateful to have had SUCH an awesome opportunity, and I learned SO much!!! Yes, Jo, we have a lot in common, as far as our sense of Design . . . Wishing YOU a wonderful new year!!! HUGS from me & my greyhounds!!! Thanks Kristi, Valerie Hart pulled this all together . . . and it was SO great to be able to learn so much from Rebecca Baer!!! Glad that others can learn from this!!! Best wishes!!! Great review of designing and developing sell sheets! Also, very timely given upcoming trade shows such as Surtex in the spring. Thanks for sharing! Thanks Esther, for taking the time to read this blog & comment!!! Thank you so much for putting this process into specifics, answered a lot of my questions. Thanks Bernadette! This is SUCH a great group of artists/designers . . . This is so helpful. Thanks Joanie, Rebecca and Cherish. Reading the article and the comments had me thinking it would be nice to have a calendar listing dates that specific companies are looking at art for particular seasons. Don’t know if that is even doable, but ……. This is a very helpful article! Thanks so much for sharing the process and answering every question! Is there a specific size that is preferred by art directors? It looks like these are 8.5 x 5.5 pieces but can you please confirm? Thank you! I usually make mine 8.5 x 11 or 8.5 x 5.5. These are 8.5 x 11, which still fits in real file folders, if anyone still uses them! Rebecca suggested this standard size . . .
Beautiful art ladies! Thanks for sharing your work and knowledge. Thankyou for posting the amazing post of the work of these three designers! I am currently needing to work on these aspects and will find this so helpful. Amazing work from all three designers! Thankyou for sharing the process it is just the type of help I am currently looking to find and am so pleased I saw it. Thankx for sharing it Valerie Hart also. Question: How did you approach the manufactures with this? Did you mail them a promo card or email your sell sheet to them? I’ve been emailing my sell sheets but don’t get a response, and my designs have won awards so I don’t know what I’m doing wrong. Any advice? Amanda, I usually email mine as PDF’s although I have created printed versions to hand out when in person. Some AD’s will reply to let me know my email was received but those are folks with whom I already have an established relationship. Unsolicited submissions rarely get a response unless you happen to send the right art at the right moment to fill a need. There is a LOT of terrific art out there to fill a limited number of spaces. No reply doesn’t necessarily mean your art is wrong. There may not be an opening for it at the moment or they may already work with someone that has a similar style. If you are able to meet with some AD’s in person they will often make comments (it’s up to you to decipher their needs) and some will even make suggestions. They don’t have the time, nor is it their job, to do this for every submission; they would spend all day just answering email. The sole purpose of art for licensing is to sell products. Awards mean that your art is appreciated for aesthetic reasons in other venues (congrats) but don’t mean anything as far as marketability to the consumer. Advice? JMHO so for what it’s worth, study products and analyze the art in comparison to your own. How are they the same/different? Is the art iconic, patterns, simplistic, complex, limited colors, etc? This is not to copy successful art but to determine where your might fit. Not all art is suitable for all products. I don’t create the same layouts for quilt fabric as I do I do for wall paper although they are both repeats. My French Roosters have been used for dinnerware, melamine, enamelware, quilt fabric, wall art, napkins and giftware but the layouts and colors vary with each product type and I customize my sheets to fit the need. Tailor your sell sheets to the manufacturer/product rather than making generic sheets. Great question, Amanda, as there are a lot of us in the same boat. Rebecca has SO much experience in dealing with many different Art Directors, and she shared so much about the business with me . . . like she said, it all goes back to selling products, and if your art would help sell more products. GREAT answer, Rebecca!!! Thanks, AGAIN!!! I have had this same experience many times… just crickets when I would submit stuff. But then I sent out a PDF portfolio of NEW ART mocked up and I had a couple of Art Directors respond immediately! So I think it really is a timing issue and when ADs are looking for Seasonal Art at a particular time. When they responded, they were making their final decisions on Halloween and Christmas for 2017! This is very helpful! Thank you for the visuals and all the great notes! Beautiful designs as well! I can’t wait till I have my first design manufactured! Thanks ALSC, for this wonderful opportunity!!! I learned so much from Rebecca and am excited to share our process . 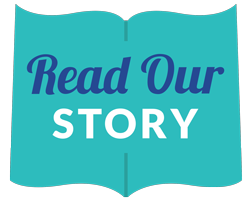 . .
Joanie, I’m so happy that this process has helped you and apparently many others by sharing it. Thanks for creating your beautiful art. Looking forward to seeing future sell sheets from you. Thanks so much, Cherish!!! . . . I am so grateful for this opportunity. Rebecca was so wonderful to work with, and her knowledge & guidance was so helpful!!! Valerie also provided MUCH needed support, in this process . . . I am very pleased with the final sell sheets and promos . . .
Beautiful work from both of you and a great article/tutorial. WOWIE. Great post. Really helped me understand the project. Thank you for sharing the knowledge.